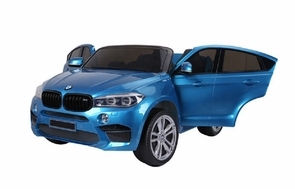 Bmw ride on car for kids is huge and in stock today. Magic Cars® brings you the all new huge 2 Seater BMW SUV BIG CLASS ride in car with real opening doors and functioning stereo! Want more? Measures almost 5 feet long! Working LED headlights, turn signals, (2) 12 volt battery power pack upgrade for greater power/longer run times, and real leather seats make this ride on car truly amazing. Dual electric motor powered ride on BMW SUV trucks are great for children of ages 1-10 and can hold up to 130 pounds. Do not be fooled by imitators, only official Magic Cars® sold on TrendTimes.com come with the Best In Class 1 year bumper to bumper warranty for free! Measures almost 5 feet long. Ride in style, works on all terrains including light snow! Plus the turn signals really work. Achieve speeds of up to 5 mph thanks to the double motor configuration. Functional lights, large all terrain wheels, and adjustable seat belt. The best part is that this ride on BMW truck can be wireless controlled via the included remote parental control. Great for training or just having fun with your kid. Want to allow the driver in the car control? No problem, as there is a selector switch inside the vehicle that allows full driver control. Choose from red, white, black, or blue colors. Drive your child forwards, backwards, left, and right at your command. Available in white or black. Watch the official Trend Times Magic Cars® remote control ride on RC car commercial below and enjoy what is so amazing today. Comes with MP3 input and working stereo with volume control. Feel good! This Magic Cars® model arrives free with the best in class 1 year bumper to bumper ride on car factory warranty. Arrives mostly assembled and comes with rechargeable batteries and charger too. All you need is 4 AA batteries for the remote control. This ride on truck can go over normal size gravel, dirt, grass, and pavement as well. Buy a RC ride on truck today and start having some fun tomorrow. Measures 57" long and 40" wide. Order right now and we will upgrade you to audio story mode where your new Magic Car® will tell your child stories! Weight Capacity of 135 Lbs.